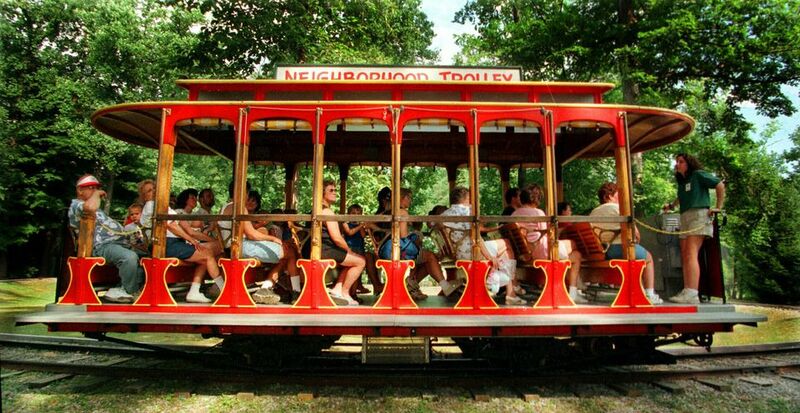 Founded in 1878 as a simple picnic ground along the Ligonier Valley Railroad, Idlewild & SoakZone is the oldest amusement park in Pennsylvania and third oldest in the United States. Named by "Amusement Today" as the second best kid's park in the world, Idlewild features seven theme areas of fun, including the Soak Zone Waterpark, Story Book Forest and Mister Rogers' Neighborhood of Make-Believe. Idlewild & Soak Zone is open seasonally. May Weekends-only: The year begins with the with the weekend before Memorial Day and Memorial Day Weekend. Hours 10:30 am - 8 pm, except for the Friday before Memorial Day when it is limited operation 10 am - 6 pm. Daily through summer: Then the park is open daily from the first Friday of June through the third Friday of August. Summer hours are generally 10:30 am - 8 pm, with a later night on July 4 for fireworks. Weekends-only late August - mid-September. Limited operation, closing at 7 pm on the middle weekends of September. Closed the last weekend of September and the first weekend of October. Park gates and Story Book Forest open at Idlewild open at 10:30 a.m.; most other attractions and areas open at 11:30 a.m. Closing times may vary based on crowd and weather conditions, but generally, Story Book Forest closes at 5:00 p.m. and SoakZone at 6:00 p.m. (weather permitting). Other attractions and rides are open until at least 8:00 p.m. Limited Operation means that some rides, attractions, small food stands, and games may be closed. Idlewild's FunDay Pass was $42.99 in 2016 at the gate for guests ages 3 and over. Discounts are given to active-duty military personnel and their dependents with military identification. Children two and under are free. Discounted tickets are available at Giant Eagle stores. Discount rates may be offered for general admission during the periods when the park is under limited operation, such as the fall weekends. Season passes can be purchased at Idlewild, online, or at area Giant Eagle locations. Both the Gold and Platinum Season Pass includes unlimited visits to Idlewild throughout the season (including HALLOWBOO! ), VIP access to SoakZone, and discounted admission to Kennywood, Sandcastle, and Dutch Wonderland. It includes two to five free Bring-A-Buddy admissions and discounted Bring-A-Buddy ANYDAY tickets. The Platinum Season Pass also includes special "Bring-a-Buddy" days, discounts for food, merchandise, games, and admission to sister parks. Located about 50 miles east of Pittsburgh, Idlewild Amusement Park is located on Route 30 in Ligonier, Pennsylvania. From Pittsburgh, take I376 (Parkway East) to the PA Turnpike to the Irwin Exit (#67). Then east on Route 30 to Ligonier. Popular with families because it rolls amusement park and waterpark into one, Idlewild is broken into several different themed areas. Olde Idlewild holds most of the traditional amusement rides, including two roller coasters and an antique merry-go-round. Story Book Forest brings favorite storybook characters to life in a shady walk-through format. Daniel Tiger's Neighborhood: Inspired by the popular children's show, Mister Rogers' Neighborhood, it features a trolley ride through the famous neighborhood. Soak Zone features 14 wet, wild water slides and a fun water activity area with tipping cones, hydro soakers, and a large Tipping Bucket that dumps out hundreds of gallons of water. There's a swimming pool, plus a water activity for the little ones too. Captain Kidd's Adventure Galley, features six water slides, crawl tunnels, net climbs, bridges, a giant tipping bucket and plenty of water spray features. Float Away Bay offers a classic way to chill in the sun aboard a tube while floating down a lazy river. Geared toward children, Jumpin' Jungle is a giant shady play area full of ropes, ladders, nets, slides and a ball pit. Nearby Raccoon Lagoon is filled with rides and children's shows designed for children. Hootin' Holler emulates a turn-of-the-century mining town, complete with the Loyalhanna Limited Railroad, the Paul Bunyan's Loggin' Toboggan water ride, and the Mine Shaft Kitchen with a variety of food choices. There are a lot of daily shows to enjoy at Idlewild, including music, theater and puppet shows. Regular shows include American Beat!, Let's Rock, Frontier Follies, and Daniel Tiger's Grr-ific Day!. Shows generally run from 1:00 p.m. to 9:00 p.m. at various stages throughout Idlewild Park. Like most area amusement parks, mid-week days are the least busy times to visit Idlewild & Soak Zone. Overcast and rainy days are also less crowded, but be aware that Idlewild does not offer rain checks or refunds. There is a lot to do in the park, however, and our family has managed to have plenty of fun at Idlewild even when it's raining. Save money on admission. Idlewild & Soak Zone offers SmartDay tickets online to save money on selected dates. Watch their Facebook page for special discounts and offers. Discounts are available online for tickets during the fall weekend season. Make friends with a Season Pass holder to take advantage of the Bring-A-Buddy tickets and discounts. Buy discounted tickets at Giant Eagle stores that are good for any day. Rain Check: If the park has to close prior to 7 pm due to reasons such as the weather, you can ask for a free return visit ticket. Ask for them at Guest Services. Picnic in the Park: You can bring your own lunch and enjoy the scenic picnic groves. You can even grill on site. However, alcoholic beverages are not allowed, nor are pets or firearms. Be Prepared. Idlewild has a lot of great information on their website to help you prepare for your visit. Don't miss the Information page with details on what you can and can't bring with you into the park. The Rides page has height and age restrictions for each ride.